Last week FamilySearch spokesperson, Jennifer T. Smith, announced that the release of their new indexing program has been delayed. As an old software engineer, I know this happens. Software always takes longer than expected. Smith wrote that “In August, [FamilySearch] invited several hundred individuals from around the world to participate in the beta (test) version of the browser-based indexing program.” I see that on 7 November 2014 FamilySearch posted a beta invitation on their blog, but I can’t figure out who it went to. 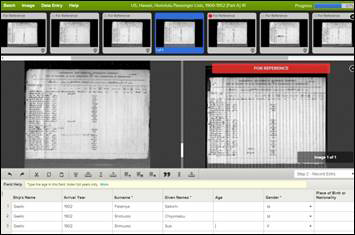 On 20 November 2014 FamilySearch expanded the scope of the beta to indexing group administrators and stake indexing directors. They shared a link on their blog to the program with instructions on how to try it. Smith provided reasons for the delay. “As we reviewed the feedback and prioritized the suggestions we received, it became clear that further improvements were needed. Based on this information, we have decided to delay the release of the new program,” she wrote. For more information about the new indexing program, see my previously mentioned RootsTech article or “The New Indexing Program: Even More Features to Look forward To” on the FamilySearch blog. For more information about the delay, see “The New Indexing Program: Feedback Provides Insight” on the FamilySearch blog.